Generally speaking, SAP does not map important functional areas such as digital archiving or e-mail management. That’s why SAP offers a certified archive interface with which documents, data, and receipts can be exported. 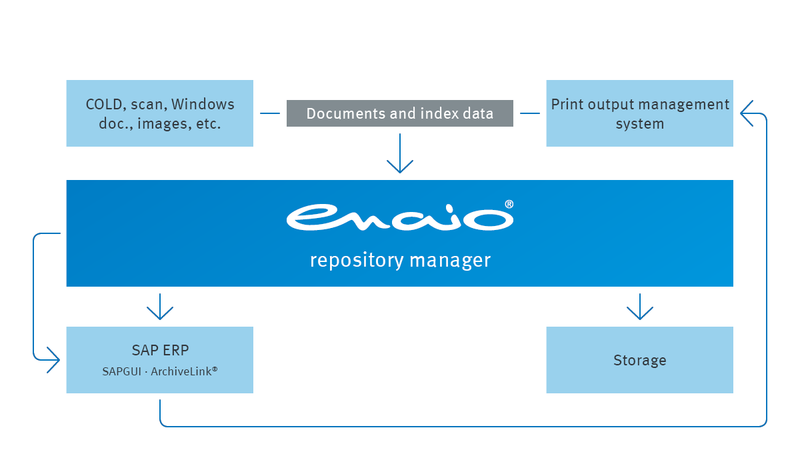 enaio® adds ECM functions to SAP that support various archiving and document management scenarios along the entire transaction chain. The enaio® connectors provide the technical components to reproduce relevant data from SAP in the ECM system, switch back and forth between the electronic records in enaio® and the corresponding SAP transactions, and write the results of processing steps in SAP. ArchiveLink® is an option for connecting enaio® and SAP with one another. Expand SAP with a wide range of enaio® ECM functions, such as archiving receipts digitally. Use enaio® to clearly collate SAP data from receipts and similar in digital records. enaio® has been successfully certified for integration with the NetWeaver SAP solution. enaio® provides the foundation for implementing the requirements of the German Commercial Code (Sections 239, 257), the German Fiscal Code (Sections 146, 147), and the GoBD guidelines. Your information and documents that need to be stored are managed across their entire lifecycle and remain archived in an audit-proof manner.